9to5Mac reports that prices for Apple's new iMac and Mac mini coming next week will be in line with current pricing, almost certainly confirming that the new iMac models will not carry more-expensive Retina displays. The three Mac mini models will likely be priced at the same $599, $799, and $999 for the two standard models and single server model, respectively. The new iMacs will also feature similar or same pricing as the current iMacs, but the top 27-inch and 21.5-inch models may feature slightly cheaper pricing in some countries. 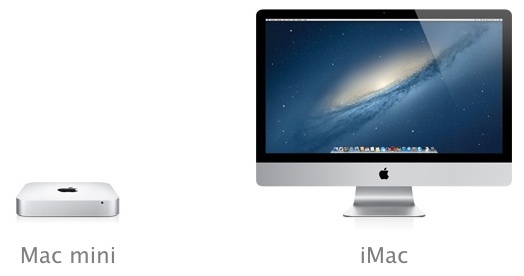 The current iMacs come in at $1199, $1499, $1699, and $1999 U.S. price points. The news conflicts with a report from earlier this month claiming that the iMac would be seeing a price increase alongside a thinner form factor. In a separate post, 9to5Mac also reports that Apple will for the first time offer 8 GB RAM module options for the iMac and Mac mini. While third-party RAM vendors have long offered 8 GB modules for Apple's machines, Apple itself has sold only 4 GB modules and thus only listed official support for 16 GB of RAM in the iMac and 8 GB in the Mac mini. The higher-density modules will allow users to configure Mac mini orders with up to a total 16 GB of RAM in the machine's two RAM slots. The iMac could potentially see up to 32 GB of RAM, although that assumes the machine will continue to offer four slots as on the current models. Considering rumors of a thinner profile, this may or may not be the case. No retina display, no sell. It's 2012, Apple, not the 1980's. Kidding, I just wrote that to see what it feels like to be one of those entitlement douches. Who's going to do the Hurry up and take my money sketch? Please no Retina screens! I've got the 2011 model, and I have no idea how I'm going to explain to the wife why I bought one! and all of them will have USB 3.0. Out of curiosity how does it make someone "an entitlement douche" if they're holding out of buying a product until it has a certain feature they want? "How quickly the world owes him something he knew existed only ten seconds ago." Retina displays on Macs have only just been introduced on a single flagship MacBook Pro model, and IMMEDIATELY these douches scoff at anything less than Retina displays on ALL products including huge 27" screens (We're talking about at least a 4K screen with nearly 9 million pixels -- the current one has 3.7 million). And of course they let everyone know through that snarky, pompous one-liner "No Retina, no sell". If that doesn't make one an entitlement douche, I don't know what does. It's even douchier than the guy next to Louis CK because at least his thing already existed, unlike 27" Retina displays from Apple. Hopefully the non-server minis will get quad-core options and a better, discrete GPU. 650m anyone? Personally, I don't give a crap about a thinner iMac. I do care about pricing staying the same or perhaps miraculously getting cheaper (yeah... not really Apple's style).